I am going to my next trip. It has been a long long time since my last serious trip and I am eager to go! My trip will be in Central America. I visited all countries of Central America, but I left some morsels here and there. I am going to visit them this time. 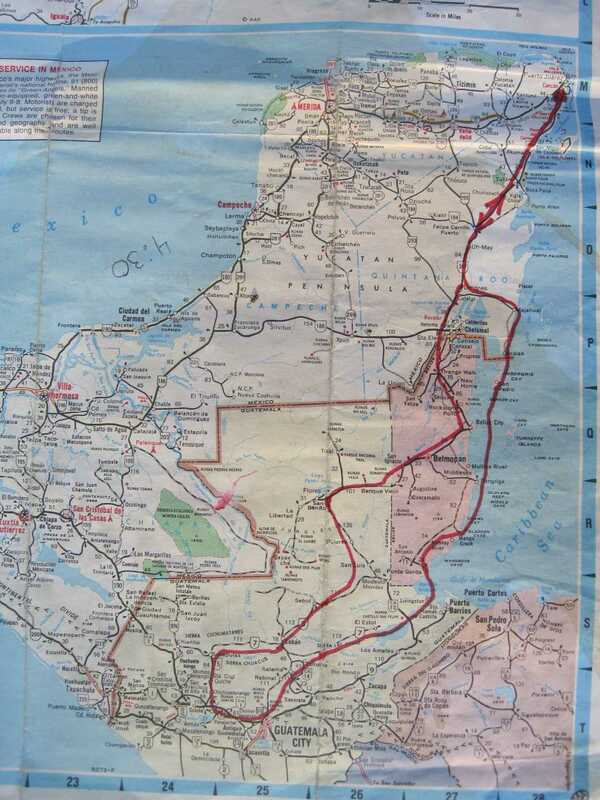 From Cancun I will go to most South-Eastern corner of Mexico, to the remote village Xcalak. It is located a few miles North of Ambergris Cay (Belize). It should be good snorkeling there I guess. I tried to visit it two times before but without success. I hope this time I will. 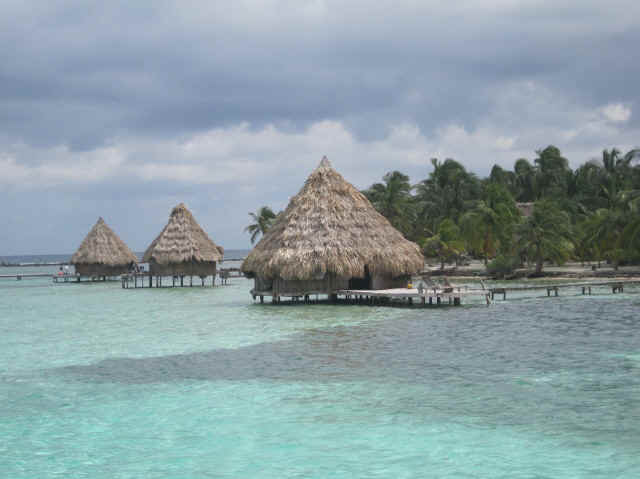 From Xcalak I will take a boat to Cay Caulker (Belize) and take a three day sailing trip to Placencia (Southern Belize) with Ragamuffin Tours company. 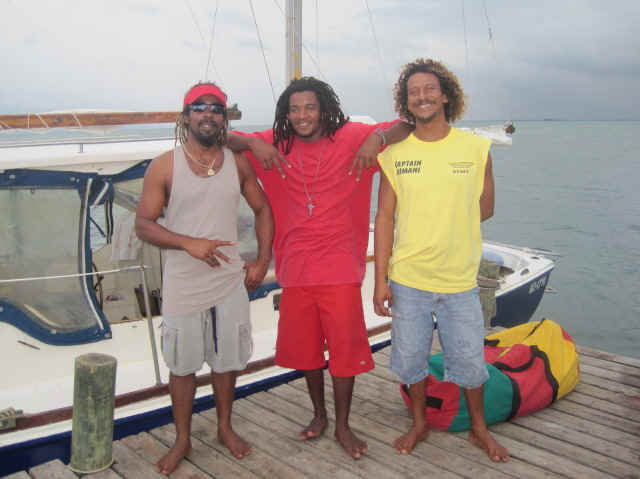 They travel on small sailboats and camp overnight on uninhabited islands of Barrier Reef, Randezvous Cay and Tabacco Cay. It supposed to be fantastic. I will exit Belize at Punta Gorda and continue to Guatemala traveling by boat up the Rio Dulce river and continue to Antigua by bus. If volcano Pakaya is still erupting I will visit it again. It is spectacular scenery! From Antigua I will visit Atitlan lake and then Coban and Semuc Champey, which seems to be the best natural wonder of Guatemala. Then I will go to Tikal and return to Cancun through Belize. My flight to Cancun was scheduled on Oct 26 at 7 am. Ten hours before that time I learned from the Internet that the category three hurricane Rina is heading directly to Cancun. US State Department issued statement advising American citizens to leave Cancun and surrounding areas as soon as possible. Wind exceeding 150 mile per hour was expected with heavy rain. Villages near shore, like Punta Arenas were mandatory evacuated. People buy food and water. Emergency shelters were prepared, but it was not enough space for everybody in them. It was quite scary, but I decided to go anyhow. In preparation for hurricane I took Gortex jacket and pants. Also I took water purifying tablets, loaf of bread, piece of salami, bottle of water and vodka. My airplane was almost empty. Minutes after my arrival heavy rain started. Streets became rivers. I rode bicycle with backpack on my shoulders. Pot-holes were not visible under the water and I terribly felt from the bicycle, when my front wheel fell into one of these pot-holes. Windows in my hostel were taped. But the hurricane itself started to loose its power. It reached Cancun only on the evening of Oct 27 not as a hurricane, but as a tropical storm. This event was celebrated in my hostel by a tequila party. Tequila was free, but there was no food. Drinking without food is not good. So this is where my emergency supply of bread and salami was handy. One moment administration of hostel asked the people to leave the roof terrace, where the party was, as it was too dangerous, they said. Next morning everything was fine, no wind and no rain. Israeli tourists as always travel in groups and they prefer to socialize with members of their group, not with other backpackers. I am still in Cancun. I stay in Cancun for so long because I was doing some dental work here, which was delayed because of hurricane. Medical tourism is flourishing here. Price is many times less then in US. Why? Because American doctors are so greedy? I don?t think so. If I was president I will start a reform of American medical system from the limitation on outrageous multimillion malpractice insurance awards, which eventually through the higher cost of doctor?s insurance gets transferred to all the patients. Second, half of all medical cost are getting spent in last two months of patient?s life. Permitting assisted suicide will save tons of money. Sometimes doctors persuade the patients on doing unnecessary operations. I saved to the system hundreds of thousand dollars by refusing to do four operations. First, 20 years ago I refused to do the operations on fusing of some of vertebrae of my spine and fusing my ankle. By the way, I saved my health too. Both operations are now considered ineffective and even harmful and are not practiced anymore. Then few years ago I refused to do operations on repairing broken tendon in my right shoulder and on knee bursitis. Both problems were resolved by mother nature and bicycle. Many people easily agree on the operations because it will be covered by their insurance. This is the internal flaw of a American medical insurance system. It should be a law in insurance practice allowing patients the most easy and free access to second opinions on the operations. Tomorrow I will leave Cancun and start my trip. 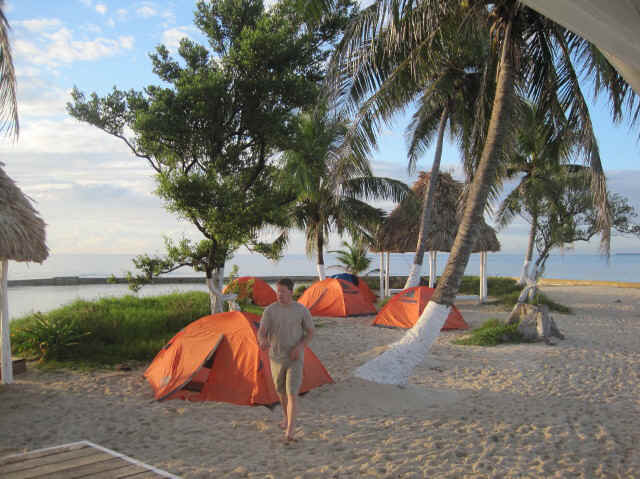 I will go to Key Caulker, Belize and start three day sailing trip to Placencia, Belize. I am not sure how I will survive reggae music, however. But I have one deaf ear, it might help. Next day after arrival in Placencia I will take a boat to atoll and stay there for one week. I dream of visiting atoll from early childhood. I will report to you how it will go. Ragamuffin tour was OK. It was a mostly pretty young crowd on board. One guy told me that he was surprised that I, at my age, selected to go on a tour with such a name, instead of going on a cruse ship. I actually did not know what ?ragamuffin? means. I read on http://www.tripadvisor.com/ several negative reports on leaking tents, inattentive staff, tons of mosquitoes and sand flies. I even bought benadryl as an absolutely must thing to protect against sand flies. Actually I was never bitten not by mosquito nor by fly. The staff of three rasta looking men was not sloppy at all. They were careful, friendly and nice, especially captain Kimani. Two tourists in turn hold a heavy duty fishing rods and from time to time they caught a big fish, barracuda mostly. So it was lots of fish for dinner. Generally, food was very good and plentiful. On final dinner we even had lobsters. Tents were new and very durable. They withstood very heavy rain one night. Snorkeling sites were not bad, but not excellent either. Only last site in marine park was pretty good. But what could you expect if these sites were visited by tourists twice a week year after year. However it is difficult to complain. Traveling on azure sea on a sail boat covered with beautiful tanning bronze bodies, what can be better. Not all girls on boat were pretty, but all were in pretty good shape. As for Reggie music. It was on all the time, but not outrageously loud. People obviously enjoy it and sometimes sing in karaoke style. I did not know a single song. There was no Katusha or Podmoskovnie vechera (Russian songs) among them. 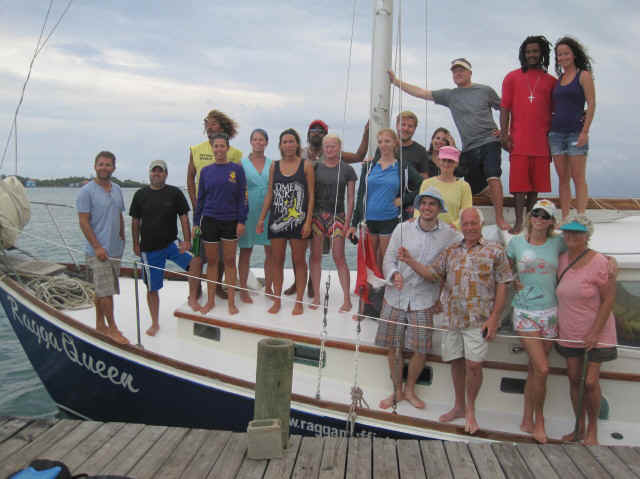 The Ragamuffin boat arrived at Placencia, Belize in late afternoon of Nov 17. I spent night in Placencia and the next day I started riding bike to the Sittee River village, from where the catamaran is sailing to Glover`s Atoll. There is no public transportation to Sittee River village. 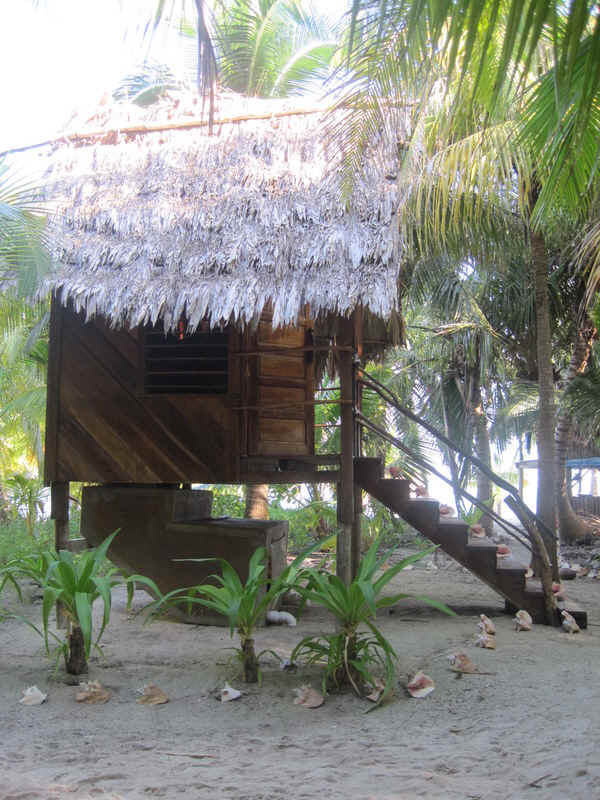 In Sittee River I spent night in quite a comfortable palapa with electricity, shower and bathroom for $9 in the Glover?s Atoll guesthouse, see picture. Next day I went to nearby village of Hopkins to buy some food for my stay at the atoll. You have to bring your own food for your week of stay. I went on bike as there was no other transportation and I was warned about CROCODILES, believe it or not. I bought lots of different vegetables as all perishable foods would perish, as I was warned. 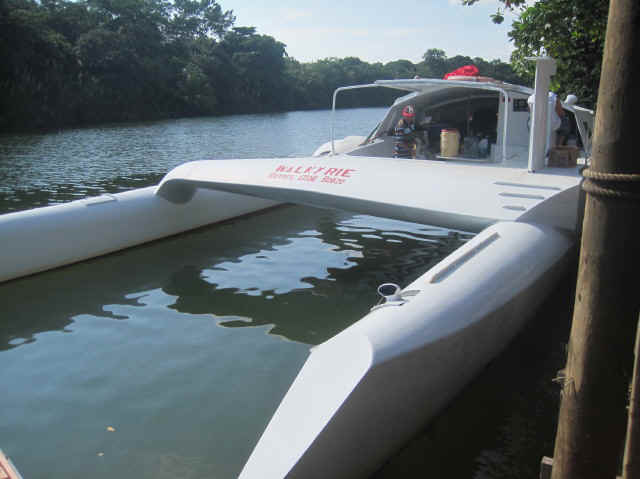 On Sunday Nov 20, a huge catamaran arrived, which was supposed to take us to Glover`s Atoll. It was the end of low season, so there were only 11 passengers. 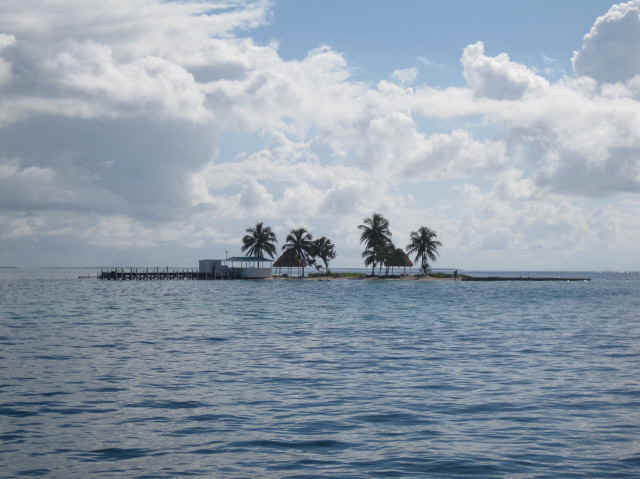 Glover`s Atoll Resort occupies a small island inside the Gover`s atoll lagoon, 72 kilometers off the Belize shore. The island can be walked from one end to the other in less then 10 minutes. It is a real tropical island, all covered with palm trees. Tropical birds sang in the trees, myriads of hermit crabs, some are quite large, were crossing the roads. While there were some paths through the forest, they were often covered with debris and dead branches. It was quite a good combination of wilderness and civilization. And it is not a resort at all. After a short tour around the island we were assigned to our cabanas, palm tree covered cabins inside the lagoon, off the shore, connected to the dry land with wooden walkways over the water. As I came to my cabana number 7, I fell in love with it. It had quite a large room with two beds, a table and a butane stove. In front of the cabin there was a large wooden patio above the water, from which there was nothing in the view other then the sea and the sky. It was paradise, tropical paradise! It was possible to cross the entire island and not meet anybody. But if you meet somebody it was also nice to have a some chat. People who came to this island were quite ordinary. But in the same time they were different. It was obvious that these people would not have fun at all inclusive resorts for example. There was one South African guy who stayed in his own hammock on the beach for $99 per week. And there was a German executive, who simply cannot find any place on seashore more closed to Germany, which is not covered with mega-hotels and luxury resorts, which he hates. My over-the-water cabana cost $347 per week. Transportation to and from the island was included in price. You cannot survive here without a good book. All atmosphere of the island makes you inclined to do nothing. I even did not snorkel a lot. Snorkeling and diving is very good here, by the way. There is very good dive shop here and excellent dive master Brian. Come while it lasts. All islands around are covered with luxury resorts, which cost ten times more then Glover?s. The Glover?s Atoll Resort belong to a woman named Bekki, who probably has tons of lucrative offers and she still has not sold the atoll so far. However it is not clear how she can keep such low prices. 5. Inside my cabana. 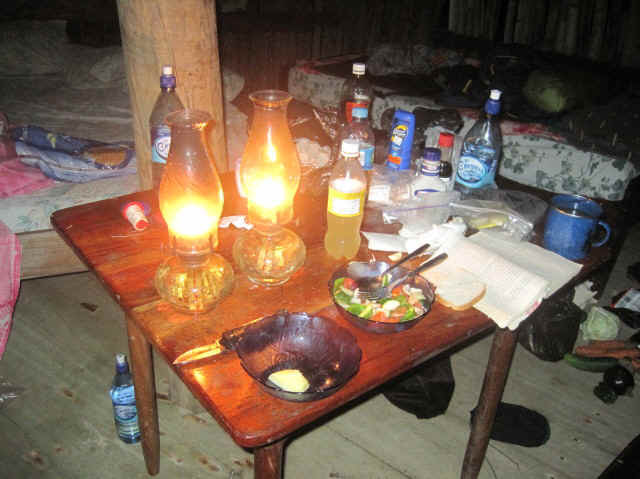 No electricity, only oil lamps. My trip is finished. I am at home. Before describing last part of my trip I would like to answer some questions on Glover's Atoll. 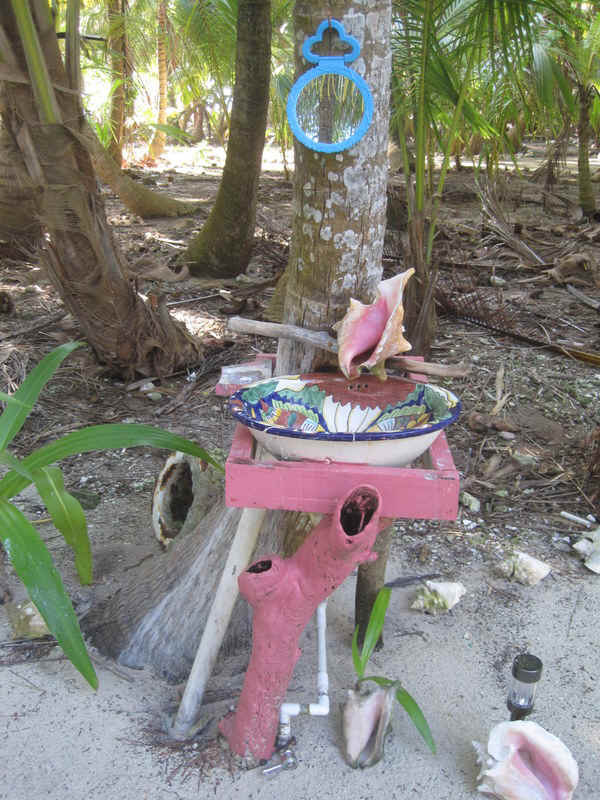 There are two outdoor showers with rain water in the middle of the island and one sink, see picture. There is one composting toilet, which smells a little, but almost no smell. The island is formed by corals, so there are no sand beaches there. 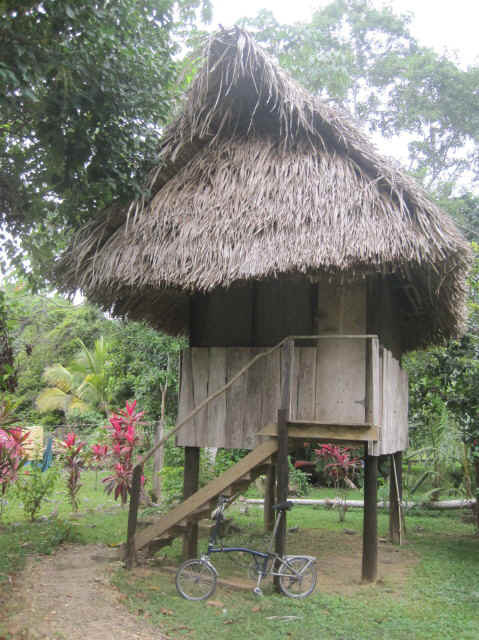 It is a short walk from any cabins to the shore from which you can start snorkeling. You have to wear fins or shoes, as there may be sharp stones or sea urchins in the water. After Glover's Atoll I went to Livingston, Guatemala. I stayed in hostel initially, then moved to empty 4 star hotel nearby for the same price $15. It is low season in Belize. I ate famous seafood soup "tapado" made with coconut milk, very tasty. I sailed through Rio Dulce river to Rio Dulce village. Rio Dulce is nice, but smelled of gasoline from many boats. Unfortunately this is the fate of the most nice places on the Earth in our age of mass tourism. Rio Dulce village is typical hectic central American village, but it has highest concentration of yachts per square meter, as it is place where they hide during hurricane season. From Rio Dulce I went to Semuc Champey, Guatemala, a place which is notoriously difficult to reach. Again, in our age of mass tourism, the omnipresent tourist companies provide inexpensive and convenient mini buses to bring you anywhere. Semuc Champey is a unique karst (limestone) phenomenon. Clear, warm, intensively blue water formed several connecting pools, see picture. In the most perfect form I saw this phenomena in China in Jiuzhaigou Park. But in China thousands of Chinese tourists were allowed only to look at this beauty. Here you can swim and dive in these warm beautiful pools of blue water. From Semuc Champey I went to Tikal, which I visited 2 years ago, then to Belize and eventually to Chetumal, Mexico. From Chetumal I took bus to Xcalak, the place which I unsuccessfully tried to visit from 2005. The bus to Xcalak takes five hours, last hour is on a very bad road. Village is quite nice, almost no tourists. Quite a good reef is close to shore. It is probably easy to swim to it in warm water. But when I got there, water was not warm enough. You probably will not freeze to death, but it will be quite uncomfortable to swim to the reef. It is possible to get to the reef with a hired boat for $100 per boat. But I noticed two local guys with spear-guns on the motor boat and asked them to take me with them. Their guns are home made, but they do spearfishing every day and are very skilled at it. They dive quite deep and they stay under water for very long time. They do not leave any stone un-turned so to say. So it was not many living creatures left there. When we swim back to the boat I was exhausted. They were young and they do it every day. It was quite difficult to follow after them. From Xcalak I went to Cozumel. Access to my favorite snorkeling place near small boat harbor was blocked by gigantic construction work of new mega resort. Fortunately another mega resort was destroyed by hurricane and large pieces of it were washed into the sea. They formed a new artificial reef. There were lots of fish there and I speared some, see picture. It was like wreck diving. This place is not far away from the town. It is South of town, just behind second lighthouse. Like wreck diving, wreck snorkeling is not for inexperienced people. PS: Please let me know if somebody is going to Cancun soon. My new dental crown is left at dental lab there.